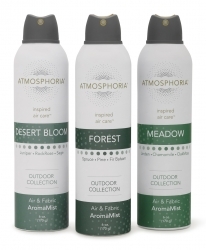 Atmosphoria's clean botanical ingredients are paving the way to a new home fragrance experience. Burlington, VT, March 19, 2019 --(PR.com)-- Atmosphoria is radically redefining the stuffy world of air fresheners. In an industry where synthetic fragrance and unhealthy chemicals are the norm, the brand is proving that consumers don’t need to sacrifice efficacy for safety. The 100% botanical and nontoxic water-based sprays were developed to perform just as well as conventional products while utilizing a clean palette of botanical, aromatherapy-grade ingredients. Atmosphoria provides smartly designed, modern and enjoyable air fresheners focused on empowered ambiance. Best of all, they don’t negatively impact indoor air quality. Founded by two certified aromatherapists with decades of experience formulating essential oil products, Atmosphoria is more than a product – it’s an experience. Since 1990, synthetic fragrance chemical usage across household cleaning and personal care products has doubled in the United States. Indoor air pollution and secondary health reactions caused by air freshener ingredients have emerged as a public health issue and consumers are demanding transparency and better, cleaner products. Atmosphoria’s inspired air care answers those demands. Atmosphoria delivers effective and enjoyable air care solutions with accessibility as the core focus. Rather than relegate these products to high-end natural boutiques, the powerful but sophisticated quiet spray technology delivery system and the competitive price point is specifically designed to bring healthy and effective aromatic experiences to everyone. The line is 100% biodegradable, botanical and nontoxic. The water-based mist is free of solvents, propellants and is not flammable. With seven scent families and 21 fragrances to choose from, there’s something to suit every room and any mood. About Atmosphoria: The brainchild of aromatherapy entrepreneurs Leyla Bringas and Anna Barrett (of Lunaroma Aromatic Apothecary and Way Out Wax, respectively), the company was founded with a clear mission – provide conventional air freshener users an immensely enjoyable, effective and safe alternative to chemically-laden industry-standard air fresheners. With a commitment to a healthy lifestyle and blissful botanical scent artistry, Atmosphoria invites you to reimagine your aromatic world.